Muriwai, also called Muriwai Beach, is a coastal community on the west coast of the Auckland Region in the North Island of New Zealand. 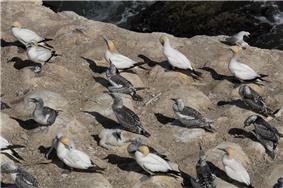 It is home to a large colony of gannets. In 2013 the first fatal shark attack in more than three decades in New Zealand happened 200m off shore. Muriwai is approximately 17 km west of Kumeu, 42 kilometres northwest of Auckland city, at the southern end of an unbroken 50 kilometre stretch of beach which extends up the Tasman Sea coast to the mouth of the Kaipara Harbour. One of several popular beaches in the area (others include Piha and Karekare), it experiences a population explosion in summer when Aucklanders head to the sea. It is in the Rodney Ward of the Auckland Region. 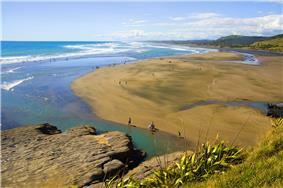 At the 2001 Census, the usually-resident population of Muriwai Beach was 2,037, a change of 14.3 percent since 1996. The median income of people in Muriwai Beach is $24,500, compared with $19,500 for Rodney District and $20,000 for all of New Zealand. The unemployment rate in Muriwai Beach was 5.3 percent, compared with Rodney District percent for 5.1 and 7.5 percent for all of New Zealand. Surfing is the main pastime at Maukatia (Maori Bay) and Muriwai Beach. Other pastimes enjoyed at Maukatia include paragliding and hang gliding, especially when the prevailing souwesterly wind provides favourable conditions. Fishing is also popular, although dangerous in many places. Bush walking is encouraged, with boardwalks in place, and the 'Hilary Trail' passes through Muriwai. Driving along the beach is popular, especially at fishing contest time, although vehicles have been mass stranded in past years. Surf boards, surfing tuition and sand yachts are available for hire at the Muriwai Surf School near the beach. There are many mountain bike trails up in the pines, mainly downhill and freeride trails. The beach was used extensively for motor racing from the 1920s through to the 1940s. Horse riding is popular along the beach, as well as through the extensive tracks behind the sand dunes. Access is also available through the Woodhill Forest Equestrian Park. Sand and rock (sedimentary), older volcanic material, with many concretions and layers in the cliff walls. A blowhole plays often. The shore platform is also well jointed, with the main rock type being piha conglomerate. Muriwai Beach has black sand, caused by the iron content derived from the ancient volcanoes in the area, including the large "Kaipara Volcano" which was situated offshore from the Kaipara Heads, and erupted 23-16 million years ago. The black sand is moved up the west coast of the North Island by longshore drift. The area has retained much of its natural beauty and isolation. Much of the land at the southern end of the beach is part of the Muriwai Regional Park. 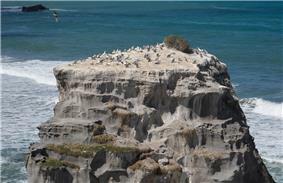 Maukatia (Maori Bay) to the south is separated from Muriwai Beach by Otakamiro Point, with its steep cliffs and rocky nesting areas that are home to the region's only gannet colony. The site of the gannetry has been identified as an Important Bird Area, by BirdLife International. The Regional Park includes a golf course along Coast Rd, and the area north of Okiritoto Stream is known as the "Five Mile Strip" or "Five Mile Block" as this is its approximate length. A horse park (parking area for horse floats and trucks to unload) is located just to the south of Okiritoto Stream. 4WD access on to the beach is also provided at this point. The Five Mile Block provides recreational trails for horse riders, and walkers. Cyclists enjoy the Coast Rd as far as the top of the Regional Park (but are not permitted into the adjoining Woodhill Forest) by the forest managers. Dog walkers also frequent the area, as it provides a wide range of off-leash walking opportunities. In February 2013, filmmaker Adam Strange was killed at Muriwai Beach while swimming about 200m offshore, when he was attacked by a small group of great white sharks. As a result, Muriwai Beach was closed for a number of days. Initial reports suggested the culprit was a bronze whaler, but it was later deemed more likely a great white was to blame. ^ "Swimmer dies after shark attack". 3 News NZ. February 27, 2013. ^ "Muriwai Beach Community Profile". Statistics New Zealand. ^ "Motor racing". An Encyclopaedia of New Zealand. 1966. ^ "". Woodhill Forest Equestrian Park. 2010. ^ BirdLife International. (2012). 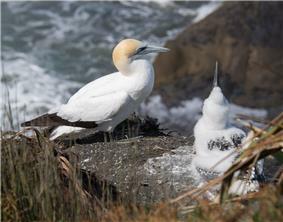 Important Bird Areas factsheet: Gannet Island. Downloaded from http://www.birdlife.org on 2012-02-16. 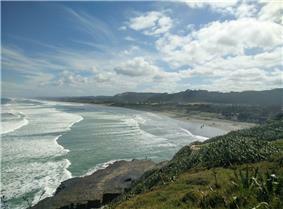 ^ "Muriwai Beach and Regional Park". NZ Bridleways. ^ "Shark attack victim's family embrace in sea". Stuff.co.nz. February 28, 2013. ^ "Beach closed as search on for shark". 3 News NZ. February 28, 2013. ^ "Muriwai shark most likely a great white". 3 News NZ. February 28, 2013.